To celebrate a friend's birthday this weekend, a group of us met up in Seoul on Saturday night for a Mexican dinner at Vatos Urban Tacos in Sinsa. We had a reservation, which was great because the place looked packed when we got there. Apparently one of the restaurant's best sellers is their "kimchi carnitas fries", a Korean/Mexican mix. So naturally, we ordered two for the table. They were good! The kimchi blended in nicely, and all of that meat with the fries was heavenly. 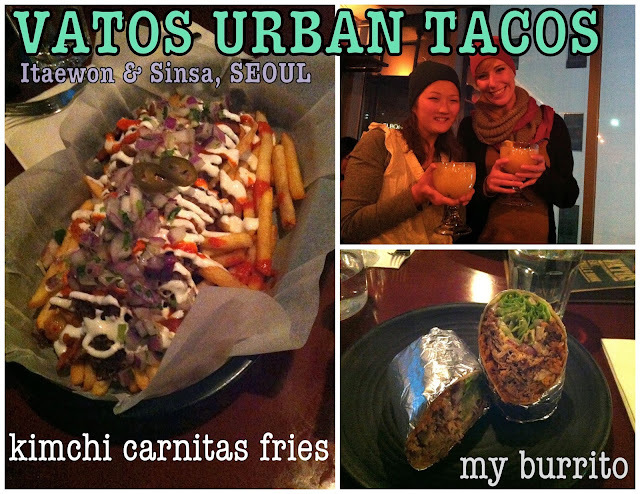 I recommend Vatos Urban Tacos if you happen to be in Seoul itching for Mexican food. Everyone I went with was very satisfied with their meal, and plan to return another day. Tips: If you don't want to wait, make a reservation! Many foreigners seem to frequent this restaurant, so someone will be able to speak English with you!